A wave of Israeli IPOs could include solar panel optimizer leader SolarEdge. 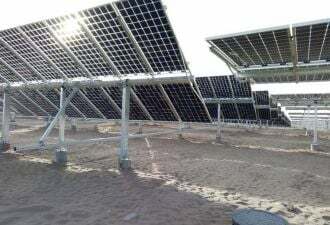 Just reported: Israel-headquartered solar balance-of-system vendor and maker of solar optimizers SolarEdge is looking to raise more than $100 million in an initial public offering next year, according to Bloomberg. SolarEdge is "in talks with financial institutions for a New York listing next summer," according to anonymous sources. Annual sales are “well north of $100 million." “The U.S. market is one of the fastest-growing markets in the world," a trend he said is “expected to continue" until U.S. tax breaks end. SolarEdge has spoken of IPO plans since 2011. One of its largest customers is SolarCity, and rumors have occasionally surfaced of an acquisition by the solar finance and installation leader. Founded in 2006, SolarEdge has raised more than $40 million from Norwest Venture Partners, Opus Capital Venture Partners, Walden International, Genesis Partners, Vertex Venture Capital, Lightspeed Venture Partners, ORR Partners, JP Asia Capital Partners and General Electric’s GE Energy Financial Services. The leader in the module-level electronics industry is publicly traded Enphase, which essentially created the microinverter market, and which shipped $82 million in product last quarter. Enphase's stock has been on an upswing and currently trades at $15.72 per share. GTM Research’s report on microinverters and DC optimizers estimates combined shipments of microinverters and DC optimizer units destined for U.S. residential systems to have topped 430 megawatts -- well exceeding 50 percent of the installations in the segment.